At the Jackson County Sheriff’s Office, we process a large number of warrants, case files and civil process jackets daily. In order to allow all our users to view and work with this content in a way that is most comfortable for them, we have implemented transparent records management. What is transparent records management? Transparent records management (TRM) is a way of organizing the same content in different ways for different users. It entails creating more than one view on the same data. 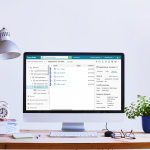 With TRM, records managers can view all of the content organized according to specific retention rules, while other users can view the same content organized in a much more granular, user-friendly way. For example, our staff processes four different types of warrants with each one subject to different retention rules. 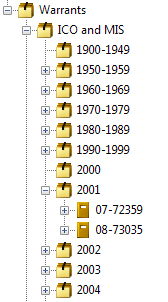 Our records management folder structure accommodates this by sorting warrants by type and year. This type of folder structure is very useful to our records manager because he deals with content from a records retention standpoint only and therefore is only concerned with viewing warrants in a batch. Since our clerks deal with processing individual warrants, they would like to see them stored in a more granular way. Whereas the record manager sees warrants grouped according to retention rules, the clerks see the same warrants grouped by type, date and warrant number. In order to create the two folder views, and to make sure that all the warrants are always filed and named correctly, we do not rely on users to manually file them, which would be a time-consuming and error-prone process. 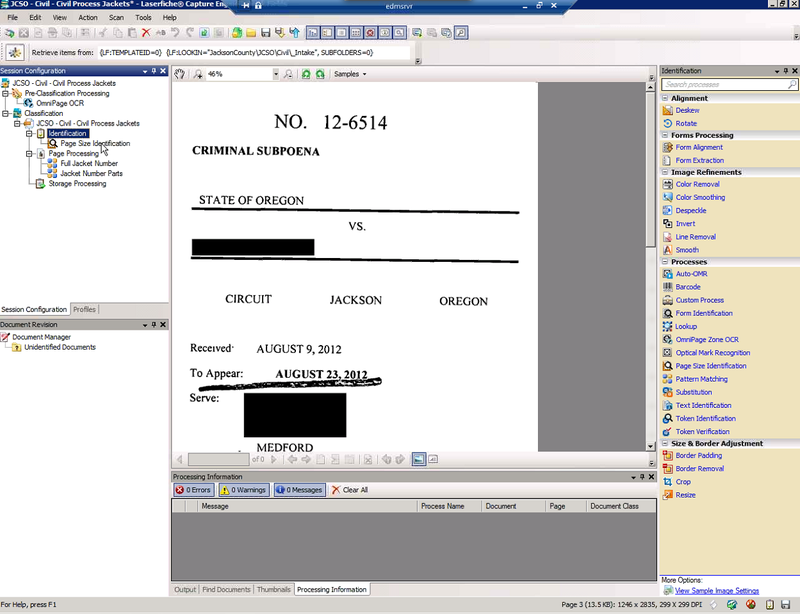 Instead, we created a workflow that automatically names and files all warrants after they are scanned in. 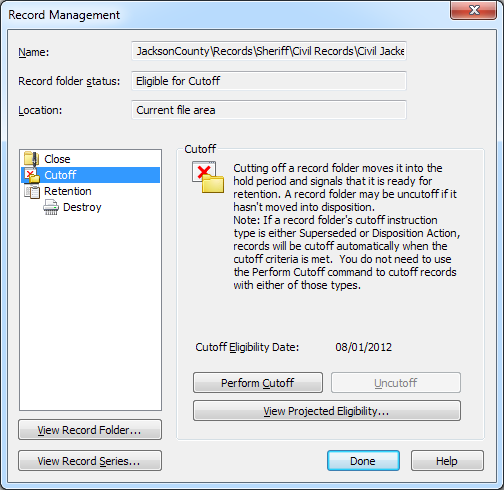 Laserfiche Workflow first routes the warrant files to the records management folders for storage, and then creates document shortcuts that are placed within the clerk’s folder structure. TRM is just one component of our automated business processes. Here is how TRM fits into the way we process civil jackets. A civil jacket consists of documents that are brought in by a deputy when a person is served. Everything, including the envelope, is scanned into the “Intake” folder by a scanning clerk. We use the “Page Size Identification” process to identify a new civil jacket. Since the envelope is always larger than the documents it contains, we know that a large page size signals a new civil jacket. 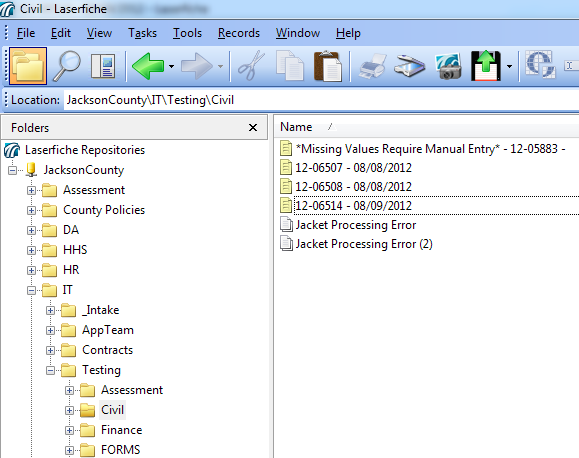 Laserfiche Quick Fields then routes the documents back to the “Intake” folder for quality assurance. 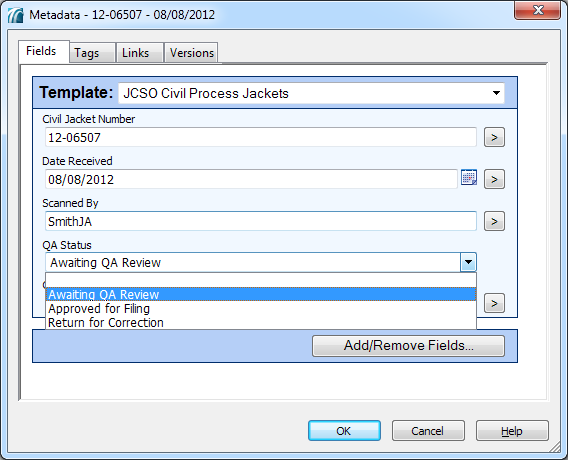 If there is a problem with the document metadata, the civil jacket is renamed with the error to facilitate quality review. One common problem is the “Civil Jacket Number” or the “Date Received” being OCRed incorrectly due to handwritten annotations obscuring the original text. In order to make sure that all the information is correct and in good order, each document is reviewed by someone other than the scanner. After reviewing a file, the reviewer changes the “QA Status” field to either “Approved for Filing” or “Return for Correction”. If the document is approved for filing, Laserfiche Workflow files the documents in the records folders and then creates shortcuts in the clerk’s folders to the same document. 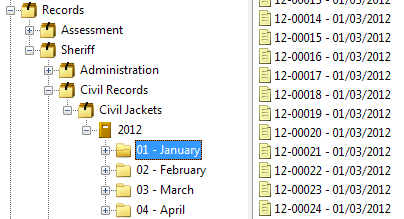 Once the civil jackets are stored in the records folders, records retention is automatically applied. Here is what the workflow that checks the civil jacket for errors and then routes it to the appropriate locations in the repository looks like. Content is never lost or misfiled. Clerks are not burdened with the records management tools or structure. 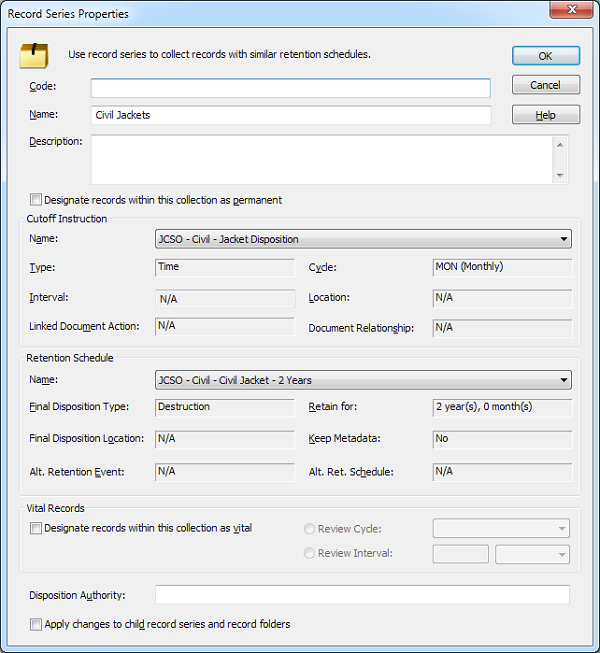 Records managers can easily make sure that all documents comply with state retention rules. It is quick and easy to change both the records management and user folder structure as necessary. 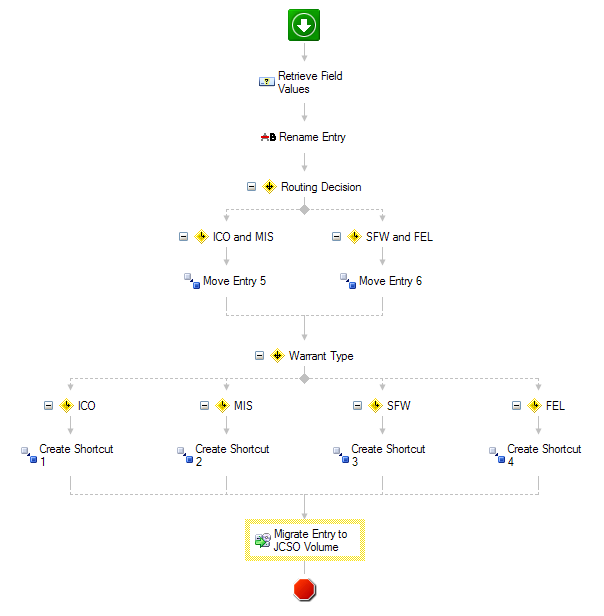 Once the folder structure is changed, workflows can be run to automatically reroute the documents and create new shortcuts. Minimal user training is required for back scanning.